Captain Lynn Rippelmeyer is one half of the first all-female crew to fly a scheduled flight in the US. She is also the first woman to captain a Boeing 747 transatlantic flight. 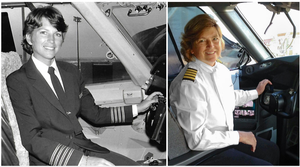 Lynn Rippelmeyer will be at the library to discuss her inspiration for flying, being a woman in a predominantly male field, overcoming obstacles, and making history in aviation. She will also discuss her work on giving back to community. Sponsored by Friends of Charles B. Stewart - West Library.